OSU succumbed to its high turnovers and low free-throw percentage on the road. TULSA — The Cowboys had another comeback attempt fall short Wednesday night. In a game that ended 74-71, Oklahoma State scored only 29 points in the first half. The Cowboys trailed by as many as 12 in the second half before pulling to within 1 point with five seconds left. 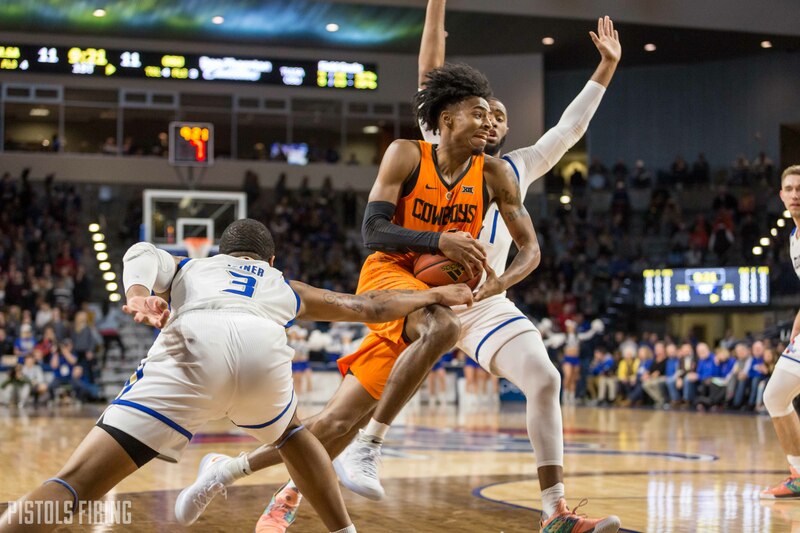 The Cowboys then fouled, when Tulsa bigman Martins Igbanu made both free-throws, and a Lindy Waters 3-point attempt at the buzzer fell short. The Cowboys fell to 4-4 on the season, and life doesn’t get much easier with an unbeaten Huston team headed to Stillwater on Saturday. For the third time this season, the Cowboys shot 50 percent from the free-throw line. The Cowboys were 6-for-12 from the line against Tulsa on Wednesday. All six misses came in the second half, where OSU was 4-for-10 from the line. Lindy Waters is the only OSU player who shot above 50 percent from the line. He was 4-for-4 against Tulsa. Isaac Likekele, Duncan Demuth and Michael Weathers went a combined 2-for-8. Postgame, Boynton said he has good shooters, and said he doesn’t know if there are five teams in the country that practice free throws more than OSU. The difficulties seem to be more mental. “We’ve got some really good shooters,” OSU coach Mike Boynton said. “We’ve shot well in some games, and obviously the last two we haven’t. They’ve been close games and you certainly can point to that as a factor. To emphasize the Cowboys’ deficiencies from the line, Tulsa finished 18-for-21. It was bound to happen eventually, but Cam McGriff slowed down Wednesday. The Tulsa game was McGriff’s first of the season where he scored less than 10 points. A lot of it had to do with early foul trouble. McGriff had two fouls in the first 90 seconds of the game. That lead to him playing a season-low 20 minutes, only four of which came in the first half. He didn’t score his first basket until there was 12:42 left. Yet still, McGriff finished 3-for-4 from 3-point range, the highest percentage of any Cowboy. He finished with 9 points and six rebounds. In Minnesota on Friday, Yor Anei joined McGriff in foul trouble, but Wednesday was different. Anei finished with only two fouls while scoring 8 points, ripping down five rebounds and swatting four shots. Anei scored all of his points in the first half, where he was the Cowboys’ leading scorer. He was also an efficient 4-for-6 from the field. Anei is up to 23 blocks this season through eight games. Mike Cunningham played 12 second-half minutes, where he scored 9 points on 67 percent shooting. Cunningham did a lot to get the Cowboys back into the game. He pulled the Cowboys within four with this jumper in the game’s waning minutes. Cunningham finished with a team-high 14 points on 60 percent shooting. After missing OSU’s first three games with a hamstring injury, Cunningham has been a steady hand for OSU. He has had three double-digit scoring games in five he’s played. The Cowboys have had 15 or more turnovers in five games this season. They had 17 against Tulsa. They came from everywhere, too. Michael Weathers had a team-high five, but five OSU players had multiple turnovers. A lot has been said about OSU’s youth being a big reason for struggle in areas such as free throws, and turnovers aren’t much different. Next up: The Cowboys host Kelvin Sampson and his Houston Cougars on Saturday at 3 p.m. inside GIA.